Tomorrowland is a land or section in the Magic Kingdom theme park at the Walt Disney World Resort in Bay Lake, Florida (Orlando area). Tomorrowland is also a land at Disneyland (California), Tokyo Disneyland, and Hong Kong Disneyland. 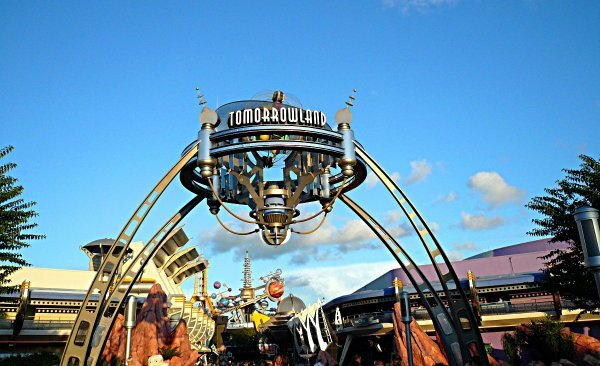 This article and section of the site focuses on The Magic Kingdom (Orlando, Florida) Tomorrowland. This land is located on the east side of the Magic Kingdom. To get to Tomorrowland from the Main Street area you make a right at the The Plaza restaurant or Plaza Ice Cream Parlor. You can also make a right at the circle and enter Tomorrowland through the main entrance, which is shown below. Above Tomorrowland Entrance photo originally by Michael Gray on Flickr. Photo enhanced and modified by NavFile. Photo released under a Creative Commons License. Tomorrowland is built on the theme of futuristic ideas. Space themed rides are a key feature of the land. Space Mountain and the Astro Orbiter are two key attractions with a space theme that are located in Space Mountain. Buzz Lightyear’s Space Ranger Spin is also another key attraction in the section that has a space theme, however, the ride is also linked to the popular Disney Pixar franchise Toy Story. Tomorrowland Transit Authority PeopleMover is also part of the land and is an enjoyable ride to get a nice overview of the whole area. Tomorrowland Speedway is located within the area and is the iconic race car ride that is part of the Magic Kingdom. Other rides are that are in Tomorrowland are listed below. Tomorrowland has a number of locations to eat at or to get a snack from. There are no reservation type restaurants, however, in the section. Below is a list of dining locations. There are gift shops located at the exit of some of the rides in Tomorrowland. There is one dedicated gift shop in the area, Merchant of Venus. Merchant of Venus sells Star Wars apparel and toys. This Tomorrowland section on our site will be updated with more information on the area and the attractions listed in this article.